My wife tells me I’m a week late on the Christmas stories. If this blog was up to my youngest daughter, you would be getting Christmas stories from the 1st of November. Anyways, this next week will be devoted to Christmas. A favorite past time for many families living in northern Utah is to visit the lights at Temple Square during the Christmas season. My family has done it on a number of occasions and when we do, I’m impressed by both the beauty, but more especially by the number of people with the same idea as ours. It’s incredible the number of people that squeeze into Temple Square to enjoy the lights. 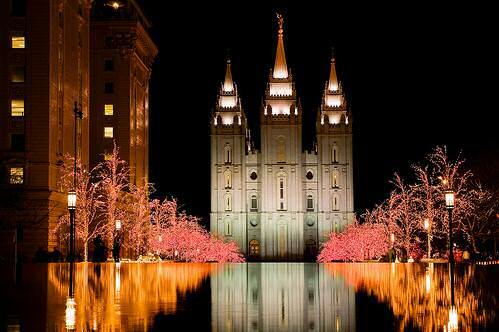 The first such occasion when lights were brought to Temple Square was during December of 1965. It was thought that the Church had to do more to share its beliefs during the Christmas season. But it almost didn’t happen—Why? 3. A. The full temple ceremony developed gradually, and the Kirtland Temple is referred to in LDS history as the “Elias of temples,” a forerunner to later temples. Gilbert W. Scharffs, Mormons and Masons (Orem, Utah: Millennial Press, 2006), 6. In 1857, United State President James Buchanan sent 2,500 troops, about one-half of the U. S. Army . . .
Gilbert W. Scharffs, Mormons and Masons (Orem, Utah: Millennial Press, 2006), 32. In nearly all cities or towns of an extensive population there are certain vices, or crimes, not exactly tolerated by law, but yet, borne with by the people as a kind of unavoidable or necessary evil: such, for instance, as gambling, drunkenness, vain and wicked amusements and allurements, directly calculated to corrupt the morals of the people and lead them from the paths of virtue and truth. Among the most conspicuous and fashionable of these we might mention, balls, dances, corrupt and immodest theatrical exhibitions, magical performances, etc.